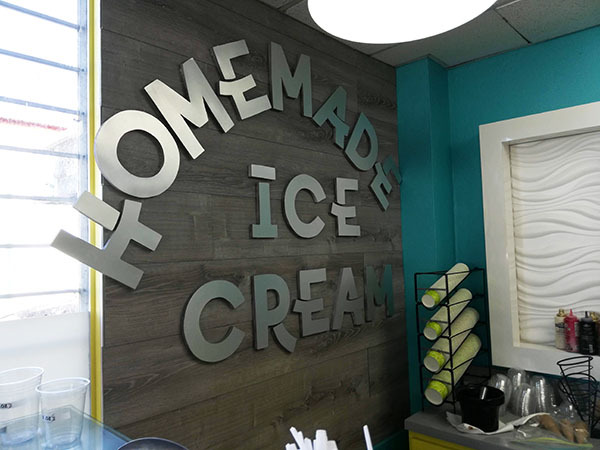 Of course we couldn’t say no to stopping for ice cream. 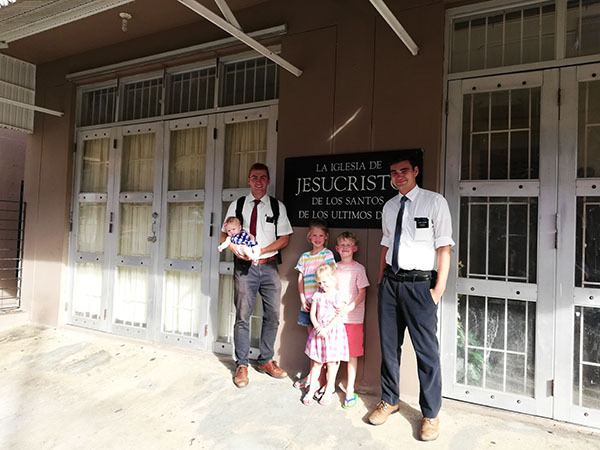 We’d been traversing the island of Vieques all day, ran into the local Latter Day Saint missionaries and chatted for some time and then accompanied them to what they suggested was the best pizzeria on the island, only to find that it was closed! 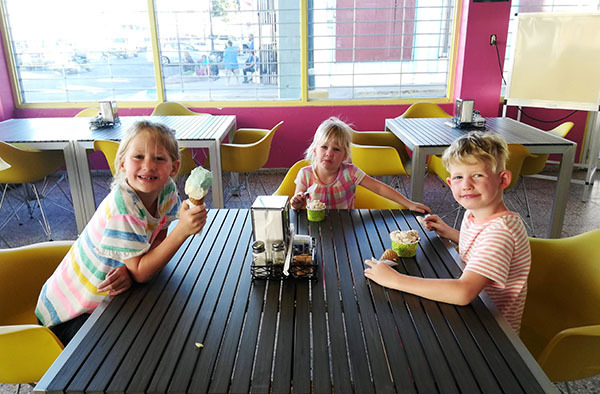 After our absolute disappointment we couldn’t resist when we walked past a brightly colored pink and yellow ice cream shoppe that our kids begged to try out. 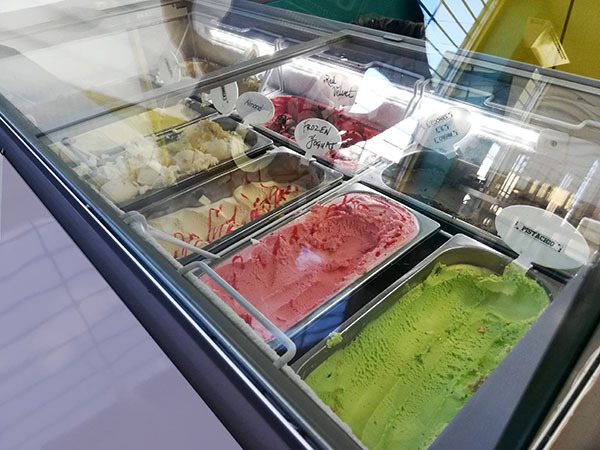 D’Frozz touts homemade ice cream with enticing flavors such as açai, cornbread, taro, ferrero, and even some you might recognize like cotton candy. 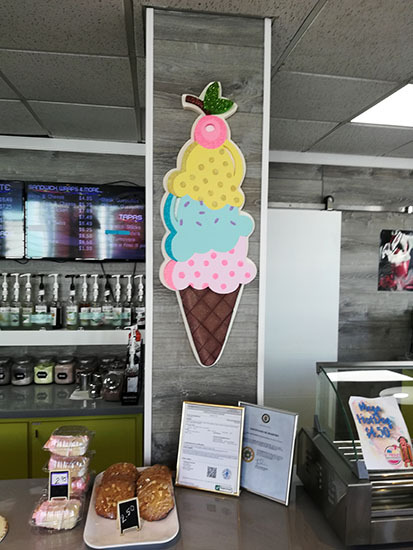 In addition to homemade ice cream, D’Frozz also serves coffee, frappé, brunch, tapas, açai, frozen yogurt, and milkshakes. 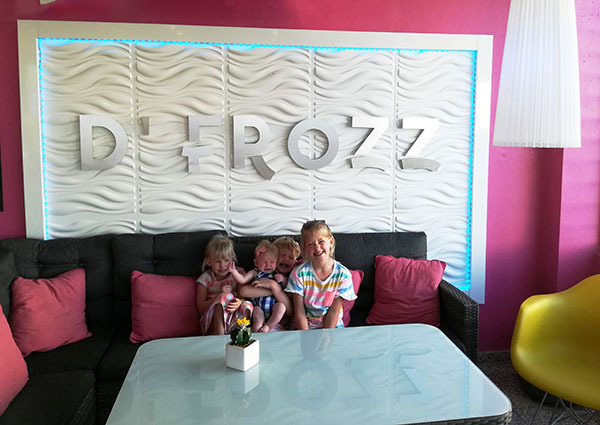 D’Frozz is located on the North side of the Island near Sea Glass Beach and you can’t miss them. The bright yellow shoppe stands out against the green forest and is a welcome sight in the island heat. I tried to encourage my family to choose flavors that they wouldn’t normally choose. Pie always goes with vanilla or cotton candy, Widmore always chooses chocolate, and Eclair usually wants something colored. I thought Widmore was going to cry when he couldn’t find anything with chocolate in it that wasn’t straight chocolate. Gabriel refused to try anything new and went with his standard mint chocolate and pistachio. In the end, my family all went with their standard favorites, and I got almond which was excellent. They were all excellent. Creamy, smooth, rich and satisfying; everything you want and expect. And everyone was happy. ► For Kids: Bright colors. Ice Cream. D’Frozz. Check. 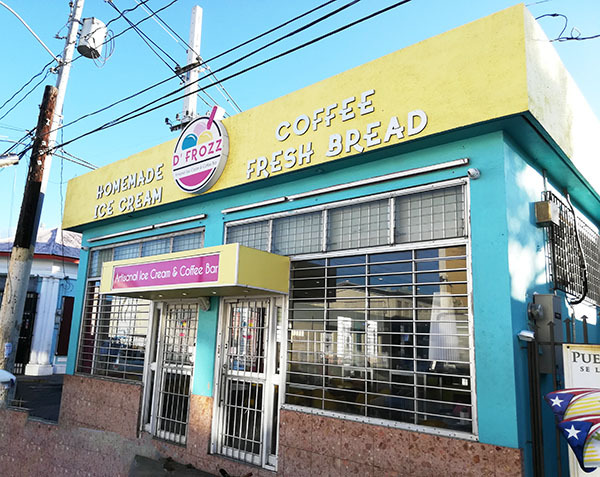 D’Frozz is the only ice cream shoppe on the small island of Vieques, which makes it quite a specialty even if there isn’t anything particularly noteworthy about it. 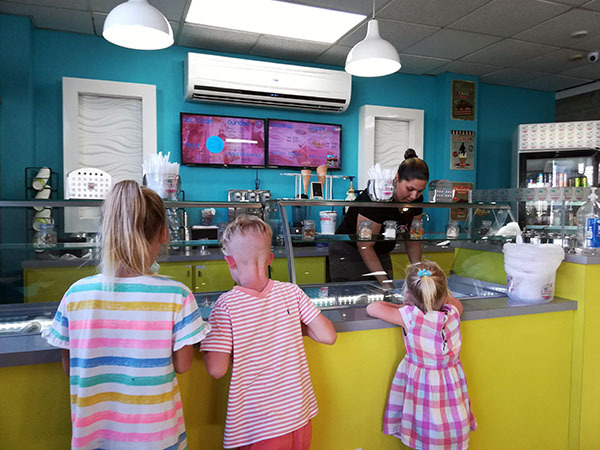 ► Nap-Time Version: Our family review of D’Frozz the only solitary ice cream shoppe on the island of Vieques, Puerto Rico. 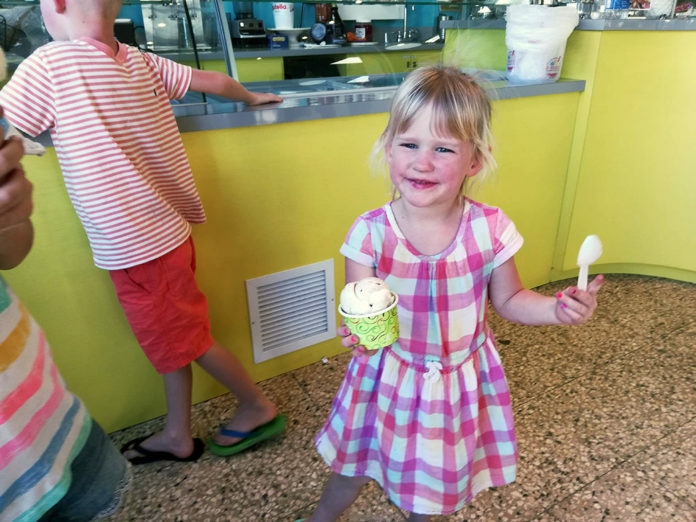 Check out our other family adventures on Vieques including Black Sand Beach and Bioluminscent Bay (coming soon)!